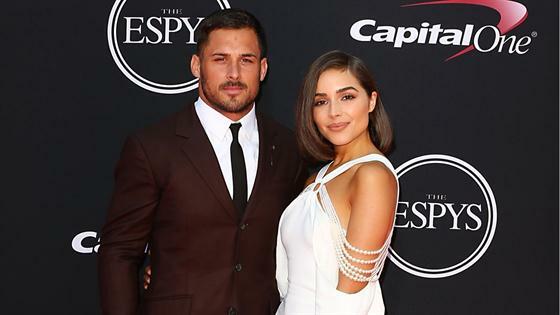 It's over for Olivia Culpo and Danny Amendola. Just days after photos emerged of the 32-year-old Miami Dolphins wide receiver on the beach with CBS reporter Bianca Peters in Miami, a source has confirmed he and Culpo are caput. According to the insider, Olivia broke it off with Danny and they are split. Per the source, the 26-year-old former Miss Universe is really upset about the situation and still extremely embarrassed. Danny has been constantly trying to explain that it was a misunderstanding, the source said, but Olivia has expressed that she has lost all trust. As for what's next, the insider explained Olivia is trying to brush the situation under the rug and will most likely act like nothing happened. To sum it up, the source said she wants things to fizzle out quietly, but they are definitely broken up. As for Peters and Amendola, a source previously explained to E! News that they "met just a few nights before they were spotted on the beach. They were at a house party and then were both part of a group that decided to go to the beach over the weekend." However, it sounds like this is where their short story ends. The source added, "Danny is new to Miami and Bianca had no idea he had a girlfriend. She is not in that world. She was a CBS journalist who is just starting her own media company...Now that she understands the situation, she has no plans to see him again. She does not want to be dragged into this." The new exes first went public with their romance back in 2016 and briefly broke up earlier this year. However, they reunited by the summer. "Olivia and Danny are exclusively back together and are in a great place since splitting," an insider told E! News in July. "They really needed space and to figure things out, but their paths led them to reconnect again and they're really happy."